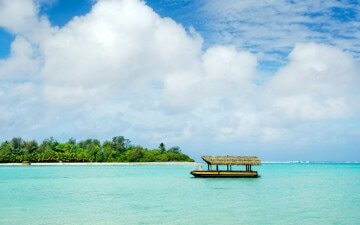 The 15 islands of the Cook Islands lie halfway between New Zealand and Hawaii in the South Pacific. Boasting rare beauty, warm welcoming people and a peaceful pace of life, the Cook Islands are paradise. Add Flights to Your Package:Air New Zealand flies nonstop from Los Angeles to Rarotonga each week, with connections from other U.S. cities. Please call us for the current special offers to add flights to your package.